Eastern Wyoming College would like to announce the recognition of the individuals who were nominated by their peers for the Wyoming Association of Community College Trustees Awards. The nominations were for exemplary student, faculty member, classified employee, professional employee, Trustee and Foundation volunteer award. Nomination packets included examples of how the nominee has had a positive impact on their community college and how they have been involved in the community. Nominees were recently recognized at an Awards Ceremony and Legislative Reception held in Cheyenne. The EWC nominee for Student of the Year was Nicole Donbraska. Nicole participates in many major activities on the EWC campus and surrounding community. She is treasurer for the Phi Theta Kappa (PTK) Honor Society, a member of both the EWC collegiate choir and band. Nicole is also a tutor in the Learning Skills Lab. In the fall 2013 semester the college and Phi Theta Kappa promoted the challenge “Commit to Complete”. This challenge is about getting students to carefully consider their future with regards to timely completion of their classes. Nicole personally took this challenge to heart as she knows that a college education is so important. She wanted to set a good example to other students by earning good grades and helping others get earn grades through tutoring. Ellen Creagar was nominated as the Faculty Member of the Year and is a long-term political science, history, and communications instructor. Ellen usually has large classes and often allows more students in from the waitlist. After students have her in one class, they will look for additional classes from her to use as electives. She has served on multiple committees including the distance learning committee, student retention team, and various hiring committees. Ellen serves as an inspiration for all when she volunteers for the Backpack Program at the middle school providing food for the weekends for needy children, or inviting the college sports teams to interact with elementary grade classes. Holly Lara, Administrative Specialist to the institutional development office was nominated for the classified employee at EWC. There are many aspects to a development and foundation operation and Holly has progressed over the years to understand and employ these varied concepts—including donor identification and prospective donor evaluation, donor communications, management of computerized donor records, stewardship activities that include multiple opportunities for donor acknowledgement, and ongoing recognition and maintenance of positive relationships with donors and board members. EWC’s nominee for Professional Employee of the Year was David Banville, Instructional Technology Specialist. David’s primary job responsibilities include supporting instructors and students who use the college’s Learning Management System (LMS). As part of a two-person department, he works closely with our faculty members providing curriculum course design support and technical support. Students also appreciate his technical assistance and his patient and kind efforts in helping them succeed in their online courses, as well as their LMS-supported face-to-face classes. The nominee for Foundation Volunteer of the Year was Tom Gardner. He has served on the Eastern Wyoming College Board of Trustees during a time that challenged the college to allocate resources carefully. Tom has served on the foundation for nearly twenty years. He has overseen growth of assets in the past eight years. His professional career in banking and finance has proven valuable to students and the college. The EWC nomination for Trustee Leadership award was Angie Chavez. Angie is a former staff member of EWC and understands many of the intricacies involved with providing a quality educational environment. She is supportive of innovative thinking and making sure investments go as far as possible. As a professional educator, she understands the power of an education and has seen lives change as young students move into college and then work or transfer. “What a great group to represent us at the WACCT Awards Ceremony and Legislative reception. Angie, Tom, Ellen, Holly, David, and Nicole, their statewide recognition is evidence of the quality individuals associated with Eastern Wyoming College. Led by our Board of Trustees, we all seek to deliver the best education and training possible in a positive, modern, and attractive educational environment. The EWC Foundation represents a strong group of community and college-minded folks who bring ongoing energy, experiences, and expertise to the table. As for our students, faculty and staff members, Eastern simply gets it done,” added college President Dr. Tom Armstrong. Save the date as Eastern Wyoming College will once again host a Job Expo on Wednesday, April 23rd. Over 30 employers are expected to participate at this Job Expo and it is free and open to the public. Currently registered participants include University of Wyoming Outreach, Menards, Department of Workforce Services and Vocational Rehabilitation, Platte Valley Companies, Wyoming Medium Correctional Institution, Wyoming Highway Patrol, Alpine Animal Hospital, Peabody Powder River Services, Cloud Peak Energy, Golden Living Center, Banner Health, Westech, Westco, several hair and nail salons, and many more. The Eastern Wyoming College Lancer Rodeo team kicked off the spring rodeo season at the annual Gillette College rodeo. In the team roping, the sophomore team of Derek Weinreis, Beach, ND and Levi O’Keeffe, Mohall, ND finished the weekend in 2nd place in the average. They start out this spring season in first place in the Central Rocky Mountain Regional standings. Trae Kautzman, sophomore, Kindred, ND and partner Brody Serres from UW tied for 2nd in the first go round. Dustin Dailey, sophomore, Long Pine, NE and partner Casey Packer, freshman, Sturgis, SD qualified for the short go. In the tie down roping, Carson Musick, freshman, Pierre, SD was 3rd in the first go, 4th in the short go and 4th in the average for the weekend. Teammates AJ Freeman, freshman, Dunning, NE and Tyler Thorson, sophomore, Towner, ND each qualified for the short go as well. Josh Davison, sophomore, Miles City, MT, was second in the saddle bronc riding average after placing 3rd in the first go and 2nd in the short go. In the goat tying, sophomore Sadie Gjermundson, sophomore, Halliday, ND, was 3rd in the first go and 4th in the short go and average. Barrel racer Kailee Koltiska, sophomore, Glenrock, WY, finished the weekend in 6th place in the average. Shayna Nagel, freshman, Springfield, SD, qualified for the short go in the breakaway roping. The next rodeo for the team will be Lancer Rodeo in Torrington on April 4-6. Eastern Wyoming College can assist students who wish to earn their Wyoming High School Equivalency Certificate with three different options. “The 2014 students who have passing GED scores may combine these tests with HiSET to earn a Wyoming High School Equivalency Certificate,” shared Diane McQueen, Director of the EWC Adult Learning Center. Each of the 3 tests will utilize test items that are aligned to the college and career readiness standards. Adult Basic Education centers prefer the HiSET test as it is affordable for students. “Over the past 50 years GED has become synonymous with high school equivalency in much the same way as Kleenex is to tissue. But this is a misconception. The HiSET, GED, and TASC are all tests that students can take to earn a high school equivalency certificate. In 2013 the Wyoming State Legislature changed the law so that students could have multiple pathways to this certificate,” added JoEllen Keigley, Director of the EWC Testing and Career Center. If you have questions about earning a high school equivalency certificate, please contact Diane McQueen at 307.532.8399. Eastern Wyoming College art instructor John Cline will present a lecture entitled “Does Gender Matter.” This lecture will highlight how feminist art historians change the way we see. The lecture will take place on Wednesday, March 19, in the EWC Fine Arts Lecture Hall at noon. The EWC Library is the sponsor of this Women’s History month lecture which is free and open to the public. Funeral services for Eastern Wyoming College student Kaylie Haun will be held on Wednesday, March 12, 2014 in the Verl Petsch Jr. Activities Center Gymnasium , 3200 West C Street, Torrington, WY, at 10:30 am. Jolliffe Funeral Home, Scottsbluff, NE, is in charge of the arrangements. You can read the Obituary for Kaylie Haun and send messages, share memories or photos to the family by clicking here. It is with great sadness that Eastern Wyoming College reports that freshman Kaylie Haun, Torrington, Wyoming, was in a vehicle accident on Friday evening, March 7, 2014, which resulted in her death. Kaylie was a member of the Eastern Wyoming College women’s rodeo team. “We are always deeply saddened by the passing of a student, especially knowing the potential ahead of them. Kaylie will be greatly missed,” shared EWC president Dr. Tom Armstrong. As a member of the rodeo team, Kaylie participated in barrel racing, goat tying and breakaway roping. “The EWC Rodeo program is deeply saddened at the loss of our teammate and friend Kaylie Haun. Kaylie was a very motivated and positive student athlete. She had the ability to brighten any day with her smile and great attitude she always had both in and out of the arena. She will be missed. Our thoughts and prayers are with the Haun family,” added EWC rodeo coach Jake Clark. At this time, funeral arrangements are pending. Click Here to view the bracket. The Eastern Wyoming College Foundation has selected former EWC board of trustees chairman Carl Rupp as its Distinguished Alumni honoree for 2014. Rupp is the 24th recipient of this annual honor. Rupp joins a long list of individuals whose careers and lives have been impacted by their attendance at Eastern Wyoming College. The Foundation has additionally recognized Mrs. Dolores Kaufman and Ms. Patti Sue Peterson as 2014 honorees for the Albert C. Conger Distinguished Service Award. Huntley native Carl Rupp received his Associate of Arts Degree from Eastern Wyoming College (Goshen County Community College) in 1967, followed by a Bachelor of Science degree in business administration from the University of Wyoming in 1970. He was a third generation farmer of Rupp Farms near Huntley, Wyoming, where he farmed prior to retiring and moving into the Torrington community in 2012. Rupp has served on a variety of boards and commissions since returning to Goshen County in 1970, including the American Stabilization and Conservation Service county board, the Farmers Home Administration county board, the WyoBraska Sugar Beet Growers Association (co-founder), the Community Hospital Board (including as president), various public school building committees and the Huntley Fire District Board. He served as a director of Tri County Bank (now Platte Valley Bank) for 27 years, on the West Highway Sewer District, and currently serves as a Goshen County Commissioner. He served on the Eastern Wyoming College Board of Trustees for twelve years, including serving as president of the board from 2010 to 2012. The EWC Foundation Distinguished Service Award has been renamed in honor of the College’s first president, Al Conger. The Albert C. Conger Distinguished Service award honorees for 2014 are Dolores Kaufman and Patti Sue Peterson. Mrs. Kaufman has given over 35 years to Eastern Wyoming College, first as an elected member of the Board of Trustees, during which she served as president of the Board for 12 years. Following her tenure as a member of the EWC Board of Trustees, she was named to the Eastern Wyoming College Foundation board of directors, a position she held from 2000 to 2009. During her tenure on the Board of Trustees and on the EWC Foundation board, the College expanded facilities and increased opportunities for students through expansion and remodeling of the Student Center, and as a Foundation member she was involved through her leadership and personal support with expansion and construction in the veterinary technology program, the welding program and construction of a new student residence, Lancer Hall. She was the division chair for the Science and Math division from much of her on campus career, during which time the vet tech program continued its development and growth. Her many years of service and dedication to the College, its students and the Vet Tech program were additionally recognized in 2010 with her nomination for the statewide honor of Faculty Member of the Year at the annual conference of the Wyoming Association of Community College Trustees. All three of the honorees will be recognized by Foundation president Patrick Korell at the College’s commencement ceremonies scheduled for May 9, 2014 at 7 pm in the Fine Arts Auditorium. 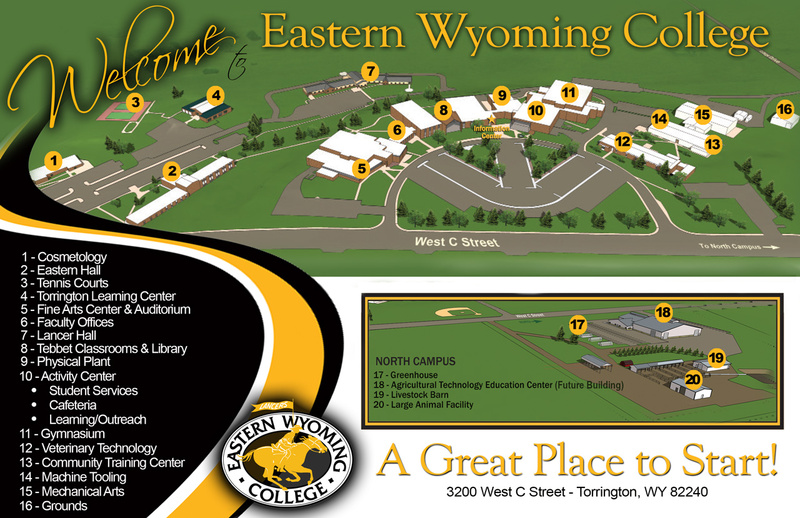 For more information about the Eastern Wyoming College Foundation, contact Oliver Sundby at 307-532-8304.